You can have a great quality time by crafting and enjoying a pallet swing with a little effort and cost. A stylish and cozy swing sofa or chair can be made by bringing together well chosen pallet pieces. These pieces are sewed or stapled together with a durable rope or nails. It can be then hanged with a tree or ceiling to enjoy the swing. The pallets must be painted with acrylic paints and disinfected with insecticides to avoid termite attack. You can decorate it with leather or fabric covering and lots of cushions making it more comfy and relaxed. 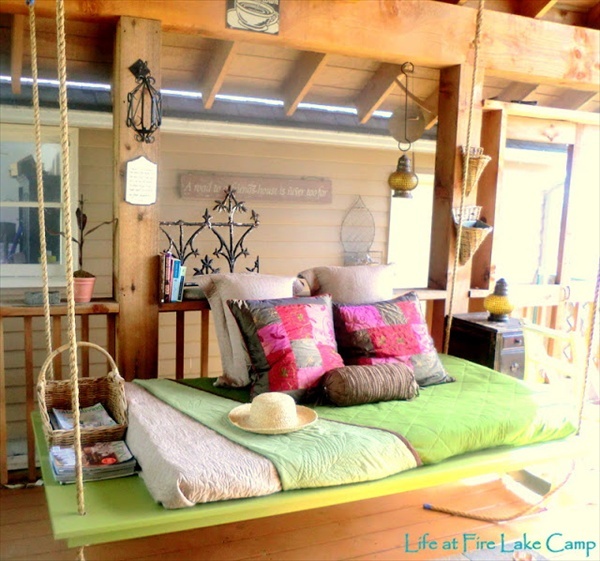 A cool summer seating arrangement or a swing bed can be made to decor your porch or lounge. Be careful about the size and construction of swing so that it can carry the desired weight. The pallet swing is much cheaper, comfortable and durable than ordinary metallic swings.